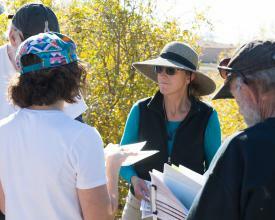 Volunteers and coordinator discuss plans for adding a Nature's Notebook program to their organization's property. Sustainable programs using Nature’s Notebook have at least one thing in common – a Local Phenology Leader has thought carefully about WHY they’d like to use Nature’s Notebook and what site and/or community needs Nature's Notebook will fill. A long-term (2 years or more) Nature's Notebook phenology monitoring program is designed to address current organizational needs and is thus planned to be an integral part of site-based programming for science or outreach. Before beginning technical research on how to use Nature’s Notebook online system, think about your needs - what need would be filled by having two or more years-worth of phenology data fill – why would that be valuable? Valuable to you personally, to your organization or to your community. Can you sustain that by engaging enough people in the process of data collection? What gaps in current programming will Nature’s Notebook fill? What are the issues that have led you to research Nature’s Notebook as a potential solution? Why do you need to implement phenology monitoring? Are your needs based upon desired outcomes for scientific or education program goals that you have not been able to achieve? Will working with volunteers to collect data, even if you are not an educator or volunteer coordinator, help you obtain enough consistent phenology data to answer a research or management question? Will data help you educate your community about seasonal or climatic change? Will it help students pay better attention or learn the scientific process? These needs can be filled by using Nature's Notebook. For example, if you are a natural resources management professional, you "should" have an interactive database that stores long-term local phenology information to be shared with other researchers, regional or national staff or supervisors. This database should also include off-the-shelf data analysis tools. In reality, you do not have this: your data are stored on one staff person’s hard drive, on a whiteboard, or piece of paper. You must ask your colleague to do by-hand-analyses every time someone would like to know when particular birds are present, plants are in bloom, or invasives must be removed. If you are a non-formal educator you "should" have a solid scientific engagement activity for one-time visitors or school groups, supported by collecting data from your site. Or you'd like to offer returning groups opportunities to participate in a long-term research project. In reality, you do not - your staff conducts some simple activities disconnected from big picture programs - nothing is linked to a larger concept like phenology or climate change. And there are no phenology activities returning visitors can do which build on a concept. Again, Nature's Notebook phenology monitoring programs can address these needs. Using this lens of thinking, visualize your current program and describe your “do haves” and “should haves”, as they are related to Nature’s Notebook. Next, complete an online form to share your information with the National Coordinating Office Staff. They will help you to achieve your goals and will use the information you submit for evaluative and educational purposes. We look forward to having you join us to create a usable long-term phenology monitoring dataset! Observations from your group are used to help create and validate data models used for research.